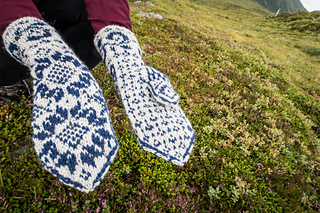 This is the third pattern in the Selbu mitten club. 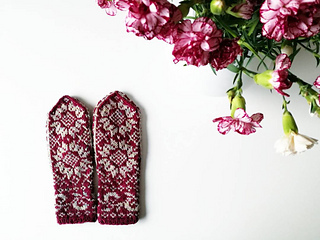 The Flora mittens offer a more intricate and organic motif, taking us yet another step away from the easily memorisable ‘Selbu rose’ (aka ‘Norwegian star’). 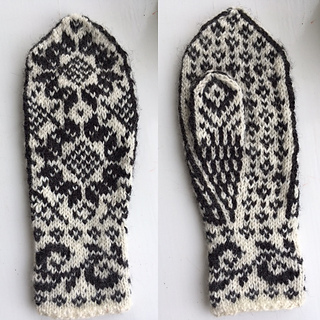 Aside from that, the mitten will stick to the construction formula you’ve grown familiar with when knitting the Selbu and Mebonden mittens. As per usual you only need a 50 g skein for each of the two colours. The yarn should be in DK weight - though of course, a heavy sport or light worsted that recommends a 22-24 sts gauge will do. I used Navia Trio, while my test knitters used 3 tråds strikkegarn by Rauma and we all used well under 50 grams of each colour. 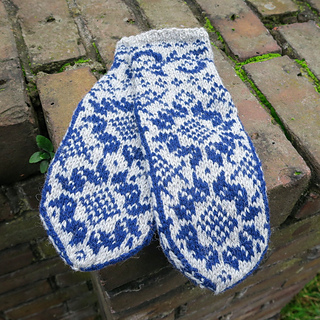 Given the floral look of these mittens I couldn’t help myself from naming these after the little hamlet Flora. 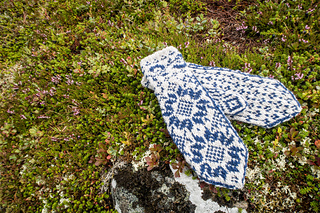 Flora and Mebonden are connected by the river Nea, flowing through deep valley pine forest hills, that holds great resemblance to the idyllic Western Norwegian fjord landscapes, despite being far east into the country.